I absolutely love crawfish pie. 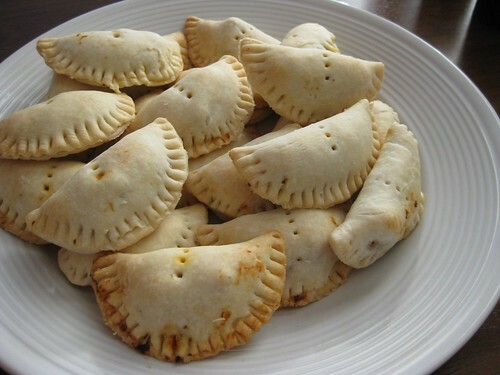 Usually for a meal, it’s served as a regular pie in slices, but since the main course for the party was the actual boil, I decided to make mini hand pies. I made the filling the night before, allowing the flavors to meld in the fridge overnight. I definitely recommend doing this because the filling was firm to work with for making these pies, and also, the flavor was definitely awesome! The only problem I have with this original recipe is that it calls for 1 cup of oil. This was WAY too much oil, in my opinion. I ended up spooning the oil/fat off of it and after measuring it, that was almost 1/2 cup of oil! My husband also pointed out that a roux is usually 1:1, which is essentially what you are making in the end to thicken the filling. So, next time, I’m using 1/2 cup of oil in the recipe! Pre-heat oven to 375 degrees F. In a 10-inch saute pan, heat oil over medium-high heat. Add onions, celery, bell pepper, garlic and tasso ham. Saute 3-5 minutes or until vegetables are wilted. Bring to a rolling boil, reduce to simmer and cook 30 minutes. Season to taste using salt, pepper and Tabasco. Remove from heat and allow to cool, preferably overnight. In a small mixing bowl, combine egg, milk and water. Using a wire whisk, stir until all ingredients are well blended. Using the rim of a cup, cut the pie dough into circles. Place about 1 tsp. of filling center of each circle. Brush the edges of pastry with eggwash and fold over in a crescent shape. Crimp the edges closed with a fork and pierce the top of the pie to create vents for steam to escape during cooking. Brush eggwash over pies and bake until golden brown, approximately 20 minutes. This sounds really good! I wonder if up north stores sell frozen bags of crawfish tails… I may have to investigate! This looks like a wonderful appetizer, but I want a slice of crawfish pie! That sounds really good. Have you ever made the actual pie? Oh, and I agree about the oil thing-so much fat! Oh, yummy! I am bookmarking this recipe, and the crawfish cheesecake one as well! We can’t wait to have our first crawfish boil of the season! This recipe looks really good. I’m considering making it for a graduation party and was wondering how many the recipe yields? This recipe makes a ton, since the mini pies don’t require much filling. I remember making 2 dozen for the party and having at least half of the filling left (which I used to make stuffed bread the next day). I would say one batch of this is more than enough for an average party. You will probably need more pie dough though, just to be on the safe side.